March 8, 2013 marks the 102nd anniversary of International Women's Day (IWD), a day when women -- and men -- gather to champion equality. Yet for me, this anniversary feels different than all of the others I've celebrated since I organized my first IWD concert in 1996. This year, there's an undeniable urgency in the air about issues that affect all of us -- including education, economic opportunity, health care and the right to live a life free of violence. The image of Pakistani girl Malala Yousafzai, who was shot in the head by the Taliban on her way to school last October, won't leave my mind. Her courage and her will -- to desire an education so badly that she literally risks her life every day to open a book -- are beyond amazing (and something we spoiled Americans would never imagine having to muster). Even more incredible than her bravery is her resolute attitude toward violence: she's not afraid and she simply won't accept it. If we all adopted Malala's attitudes, we'd be much closer to protecting and empowering women and girls around the globe. Yet, here's the great news: we don't have to endure personal tragedy in order to take a stand for equality. Even simple actions can create change. Some of your favorite actors from film and television are involved in causes that empower women and girls around the world. Learn about the most pressing issues facing women globally as you follow Amy Brenneman's trip to Peru, America Ferrera's visit to India, and Olivia Wilde's experiences in Africa. 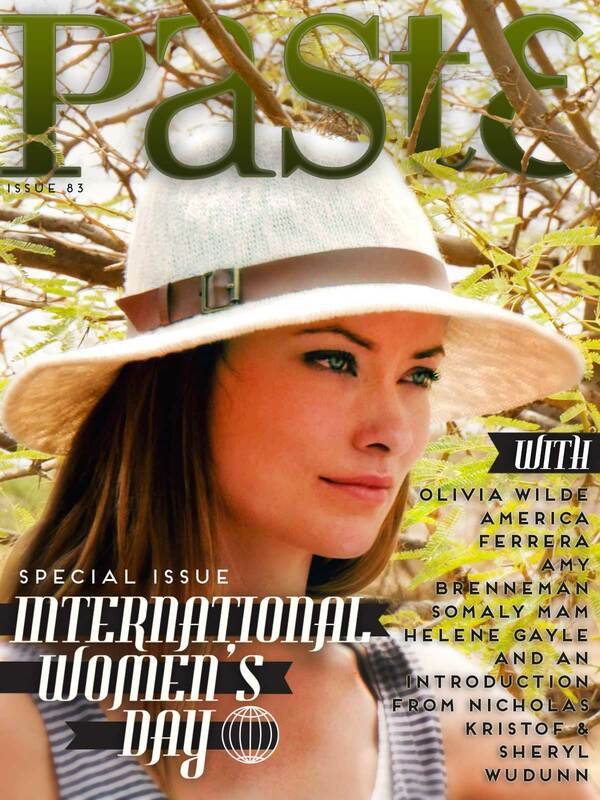 PASTE magazine has dedicated its entire current issue to International Women's Day, including an introduction by Pulitzer Prize winning journalists Nicholas Kristof and Sheryl WuDunn and an exclusive letter from musician activists Annie Lennox and Elton John. Cover image courtesy of PASTE magazine. This March, join CARE and the global action campaign 10×10 for the girls education film, Girl Rising. Find a screening near you here. Or host your own with our campaign starter kit. Girl Rising spotlights the strength of the human spirit and the transformative power of education. The film puts a face on the 66 million girls around the world who are currently out of school. A decade ago, Marsha Wallace started a monthly dinner club that raised money for charities focused on women. Now with more than 400 chapters worldwide, her organization is making a huge impact. This March, join or host a dinner with Dining for Women to support Her Turn Girls and Education Alliance. Her Turn improves the quality of teaching in Nepal by offering teacher training and empowerment workshops for girls. In honor of International Women's Day, help Every Mother Counts celebrate by participating in "Change the Story" beginning March 8th. (Follow Half the Sky Movement and Every Mother Counts on Twitter for more info.) Together, we'll be creating a poem to celebrate women everywhere. Then participate in other ways to tell your own story via social media or on the EMC website. Help Half the Sky Movement impact the lives of women and girls around the world by unlocking up to $500,000 in donations through a fun Facebook game developed by Games for Change. The tasks and issues portrayed in the game all have a real-world equivalent in donations and social action opportunities. Players will embark on a global journey which begins in India, and moves on to Kenya, Vietnam, and Afghanistan, ending in the U.S. Along the way, players will meet different characters and take action in a very simple way by unlocking funds from the game's sponsors. Women for Women International invites you to recognize and celebrate International Women's Day 2013 through its March for Women campaign. On March 8, send an eCard to an incredible woman in your life and let her know she is amazing! March 2013 is Women's History Month, and it also marks 100 years since suffragists marched on Washington. The National Policy of Nagging, a Pinterest board created by the US National Archives, honors this anniversary. Suffragists faced a difficult road in their march towards equality. Visit this special Pinterest board to add your own pins and share ours to mark this historic anniversary. For a gallery of images from the National Women Suffrage Parade of 1913, click here. For more information about actions you can take, please visit EQUALS.